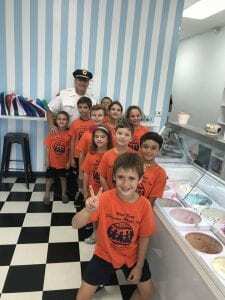 The Cleveland Police Foundation treated the kids from Discovery World’s Summer Camp to ice cream at Kamm’s Corners Ice Cream Company on their last day of summer camp!! Lisa from Kamm’s Corners Ice Cream Company took us on a tour of the shop and showed us how the ice cream is made. Captain Keith Sulzer talked to the kids about safety and the importance of taking their education seriously. A big thank you to Lisa Kay from Kamm’s Corner Ice Cream Company and Ms. Urban and Ms Baeslack for bringing police and summer camp kids together! !